Local emergency drainage and plumbing company Master Blaster have been a client of our for many years now. The company provide a wide range of emergency drainage repairs conforming to all requirements set out by insurance companies. Many people don’t know that if you have a problem instead of going straight to your insurance provider to lodge a claim you can go to Master Blaster and have the problem fixed quickly and all the insurance paperwork taken care of. 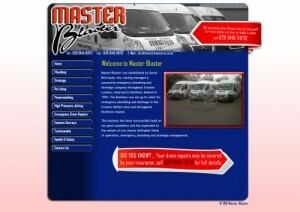 Master Blaster required a bright, dynamic and interactive website to promote their growing business into the future. The site includes information on all aspects of the work carried out as well as flashes and small animations to keep the user on the site for longer. Ardnet Online Solutions providing Website Design in Belfast and surrounding areas.